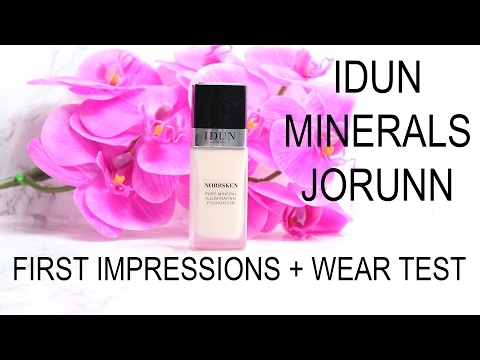 Today I’m thrilled to be sharing my Idun Minerals Norrsken Liquid Foundation Review in Jorunn on pale skin with you. I recently received this foundation as a PR sample. Norrsken is a pure mineral illuminating foundation. It’s a water-based formula that gives you luminous and healthy-looking skin, not cake face. It has a bit of lingonberry oil in it to help with hydration. Norrsken means Northern Light in Swedish, which I think is beautiful! Idun Minerals is makeup brand created by a team of Swedish scientists and skin experts. They started as a pharmacy exclusive brand in Sweden in 2011. The name Idun comes from the Norse goddess of eternal youth who kept a basket of magic apples that she shared with the other gods to keep them young. They have a full range of makeup available. I love that they do cater to pale skintones. All of their formulas are talc free, silicone free, fragrance free, bismuth oxychloride free, and paraben free. They are, of course, cruelty free too. 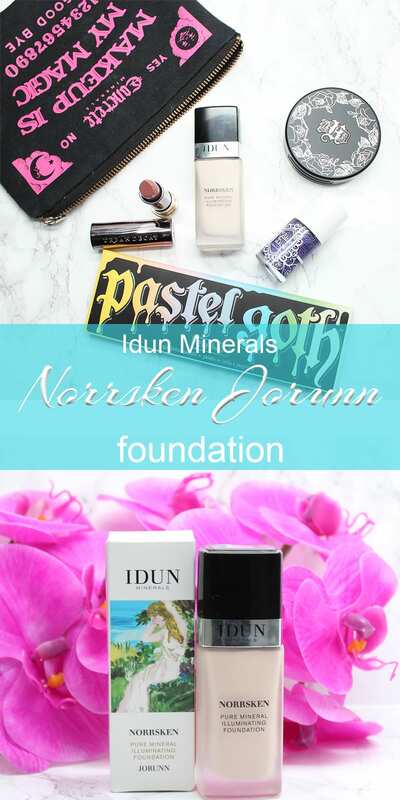 You can now buy Idun Minerals Norrsken Foundation on Amazon! 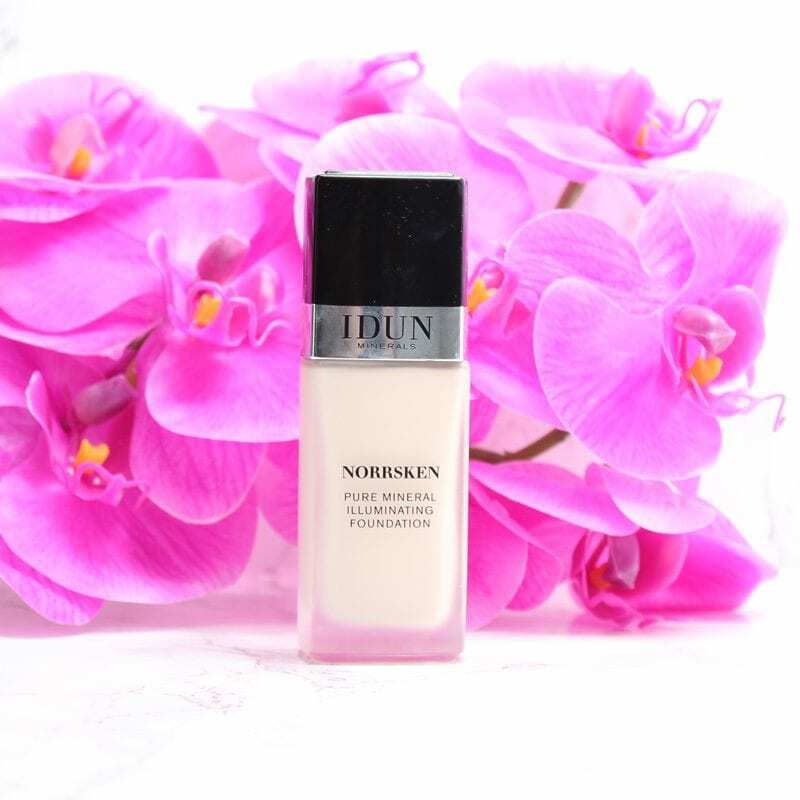 Idun Minerals Norrsken Liquid Foundation is currently available in only 9 shades. While Jorunn works well for my pale skin, if you have a deeper skintone than medium, I don’t think you’ll find a match in this line. I was pleasantly surprised by their pale range though! Idun Minerals Norrsken Liquid Foundation is $35 for one ounce. Kat Von D Lock-It Foundation is $35 for one ounce. Urban Decay All Nighter Foundation is $40 for one ounce. Cover FX Natural Finish Liquid Foundation is $40 for one ounce. Too Faced Born This Way is $39 for one ounce. NARS Sheer Glow is $47 for one ounce. Illuminare Moisturizing Mineral Liquid Foundation is $29 for 1/2 ounce. I swatched Idun Minerals Norrsken Liquid Foundation in Jorunn around some of my favorite pale skin foundations. These are slightly blended out on my arm. 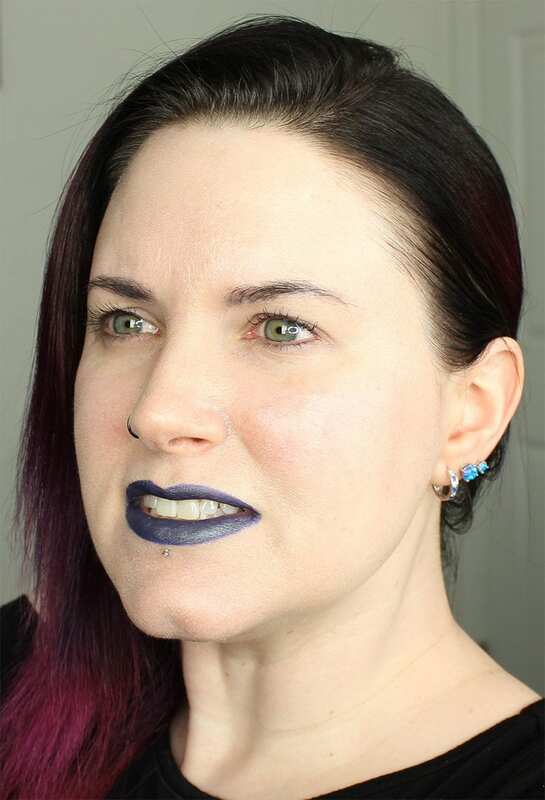 Nyx Total Control Drops in Pale – I love this color but the formula is difficult for me. 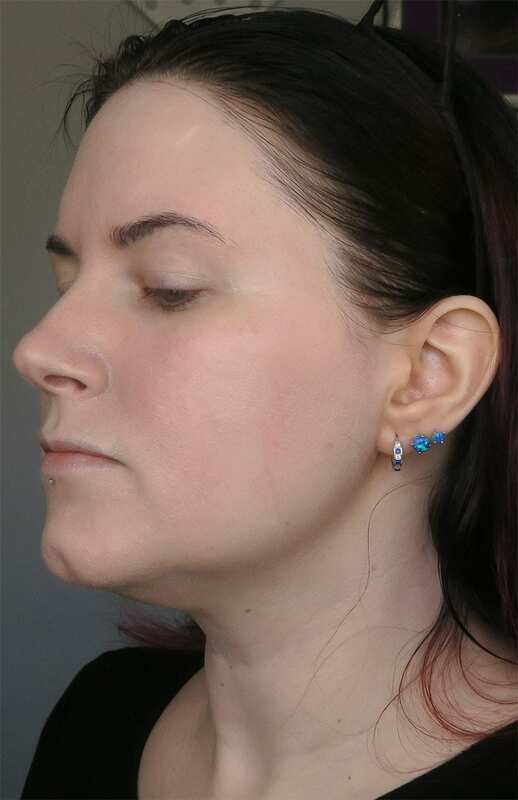 Cover FX Liquid Foundation in N0 – this is a great color but I am often unhappy with how it looks on me. Kat Von D Lock-It Concealer Creme in L1 – this is my all time favorite concealer. 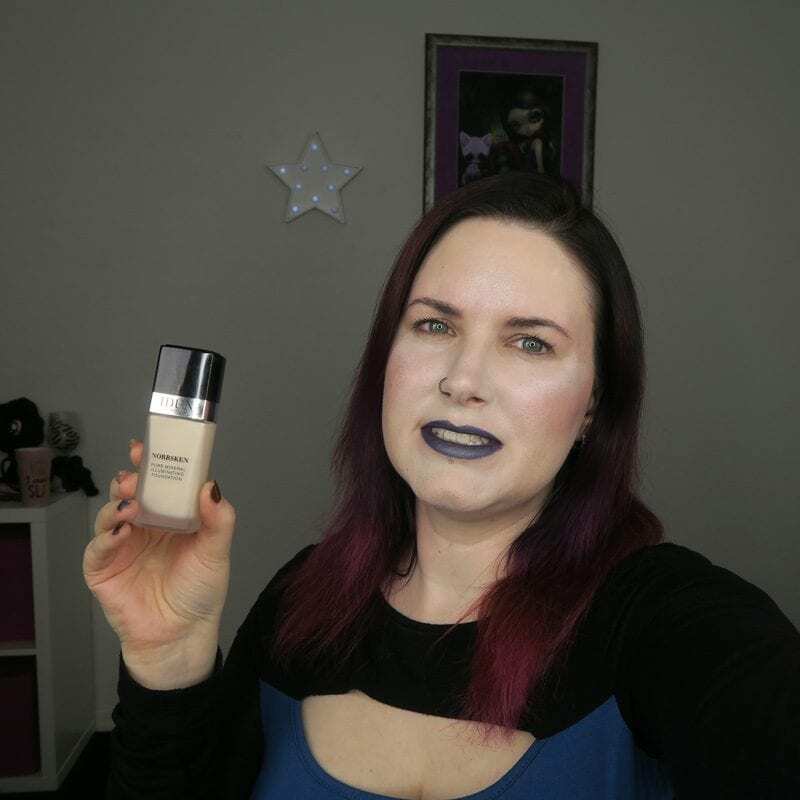 Kat Von D Lock-It Liquid Foundation in L41 – I love this color but the formula is difficult for me. 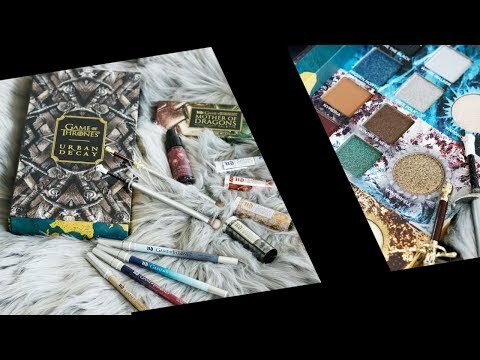 Kat Von D Lock-It Powder Foundation in L42 – I just bought this so I haven’t worn it yet but I did use it to touch up in the video. Buxom Show Some Skin in Tickle the Ivory – I like this when mixed with a bit of white & worn on top of KVD Concealers in L1 and L3. FOM in Light – I like this for sheer foundation days but I need to mix it with just a drop of white to make it a better match. 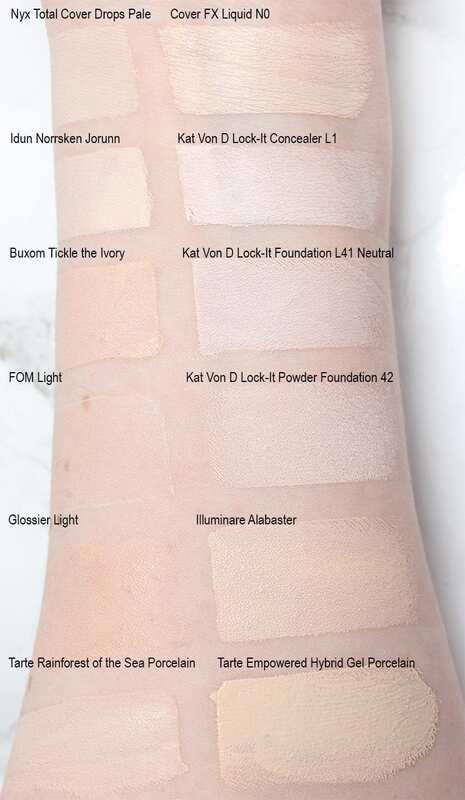 Glossier Perfecting Skin Tint in Light – I like this when mixed with a bit of white & worn on top of KVD Concealers in L1 and L3. Illuminare Moisturizing Mineral Liquid Foundation in Alabaster – This is a good color match. Tarte Rainforest of the Sea in Porcelain – I just picked up a sample of this from Sephora. Tarte Hybrid Gel Foundation in Porcelain – I find this formula difficult to work with. 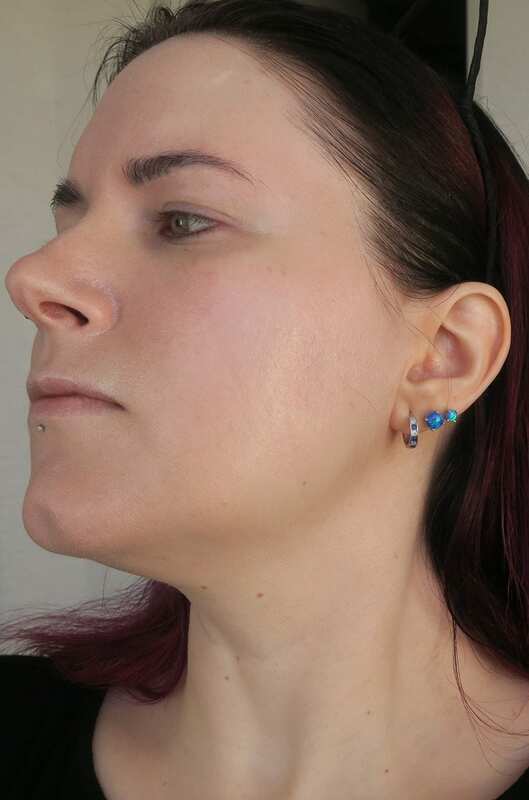 I took these photos of me wearing Idun Minerals Norrsken Liquid Foundation in Jorunn under various lighting conditions on two different days. I did not retouch these photos at all. I did not use any sort of filter on my photos or my video. 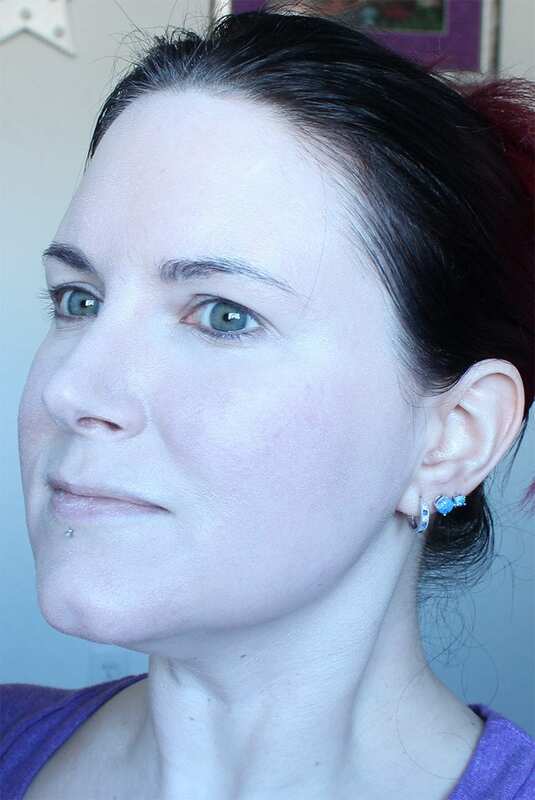 You can see all of my flaws on my pale skin – rosacea, hyperpigmentation, fine lines, pores etc. In fact, I do think the paler you are, the more visible your flaws are. 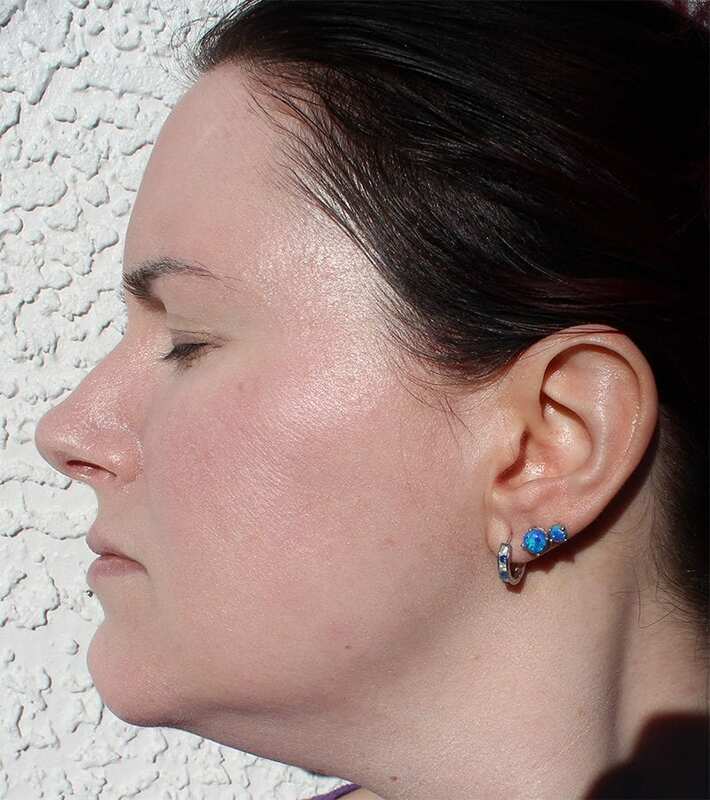 I noticed when I tried fake tanner all over once that it hid my rosacea and everything else. Late in the day, under studio lights, with only lipstick on. (1st wear test) Wearing Urban Decay Vice Liquid Lipstick in Time. Indirect sun, right next to the window, no studio lights, around 3:15 pm. (2nd wear test) This shot makes me look super pale. The only negative I have about Idun Minerals Norrsken Liquid Foundation is the limited shade range. It only goes from light to medium skintones. It has nothing to offer for deeper skintones currently. Since this is such a great formula for my dry, sensitive skin, I hope they expand it for others with my skin issues! Share if you love reviews like this! After searching for the perfect foundation, I feel like I’ve finally found it. I love this one! If you have dry, sensitive, finicky skin like I do, I think you’ll love Idun Minerals Norrsken Liquid Foundation. If you’re pale like me, Jorunn is a dream come true color. You can use the code IDUNxUSA at Idun Minerals to get 20% off until February 10. This is not an affiliate code. 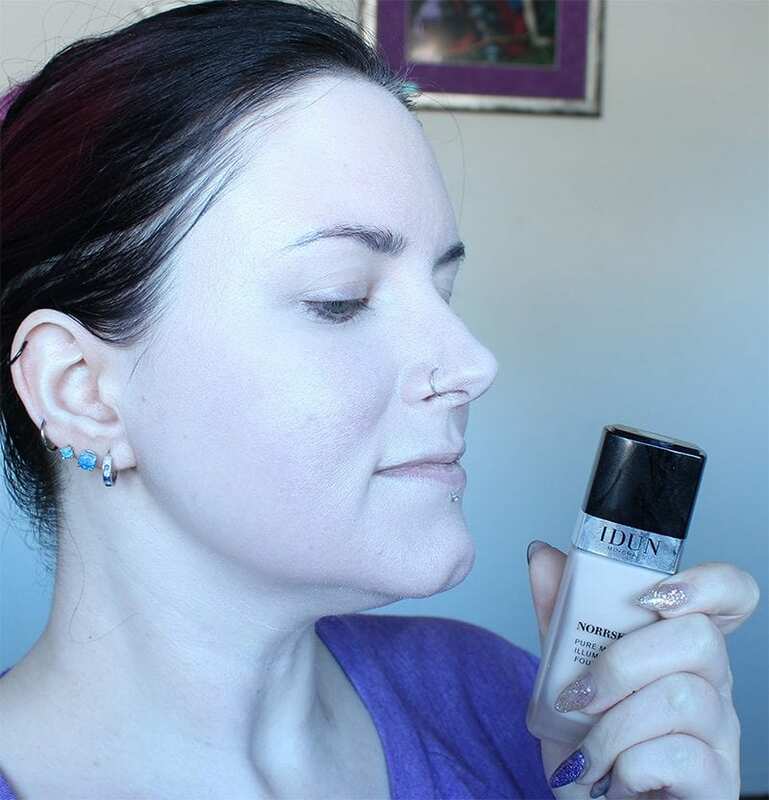 What do you think of Idun Minerals Norrsken Liquid Foundation? It’s a great foundation that I wish I could love more, but Jorunn is sadly a tiny bit dark and yellow on me. The foundation looks great on you! Idun’s liquid foundation is fantastic on drier skin (with my combo skin it’s better in winter, but colour is better in summer – darn it!). I don’t know how much from Idun you are getting in the US, but they have some lovely powders (and powder foundation) and lipsticks as well. They also have nail polishes and eye products, but I’ve yet to try those (I hear the polishes in particular are great, though). Re: shade range keep in mind the general population of Sweden and the other Nordic countries. Darker skin colours wouldn’t sell well as the market is quite small (compared to bigger Western countries). While Sweden might be the most ethnically diverse Nordic country, Sweden and the other Nordics have a small dark skinned population (darker skinned people in the Nordics are primarily immigrants or descendents of immigrants, and most of these immigrants come from Middle Eastern and West Asian countries with a later influx of Africans). Since it’s not the biggest brand (mainly sold in pharmacies over here) *I* don’t think they have the budget to cater to all skin tones *yet*. If they make it in the US I presume they eventually will release darker colours as well. Thanks for the background on Sweden! Yes I love it for my dry skin. You might like Illamasqua Skin Base in 1 or 2 for your skin. I’ve been seeing a lot of this line lately, I have to check it out! This is such a great match for you. Thank you for posting all the comparison swatches. That’s so incredibly helpful!